September 15, 2012. 7 Comments. Categories Chilis/Stews, Comfort Food, Soups, Tuscan. Tags bacon, cannellini beans, kale, rosemary, sausage, soup, Tuscan White Bean and Sausage Stew. 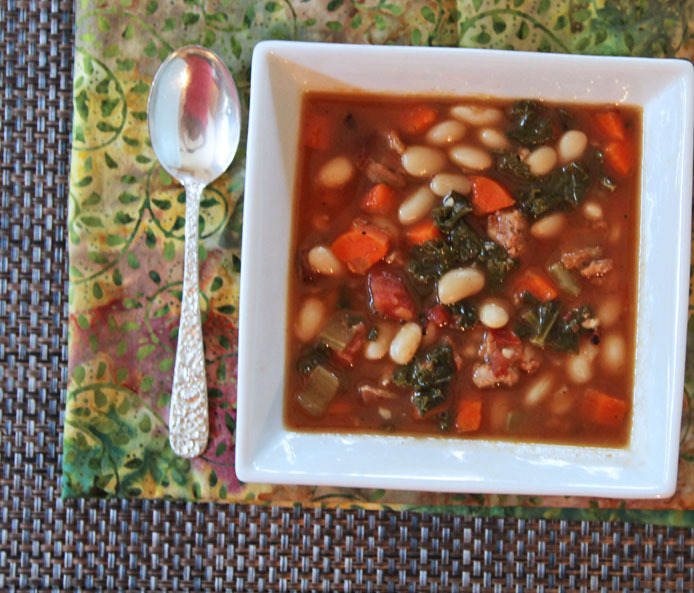 I was flipping through a recent Cook’s Illustrated and found a recipe for “Hearty Tuscan Bean Stew” that promised to be as comforting and delicious as any you would find in Tuscany. The article went on to say that Tuscans are known for their expertise in cooking Cannellini beans. The recipe itself wasn’t really that different from how I prepare a similar soup. But it did offer some tricks to make sure that the beans didn’t become mushy or explode. The result was as promised… a hearty, very flavorful and supremely comforting stew. The recipe suggested not just soaking the beans, but brining them overnight by adding a healthy amount of salt to the water. Additionally, the stew is cooked on a low heat to make sure that it cooks gently without busting the beans. This process worked beautifully! The beans had a perfect texture that was still firm and in tact yet buttery at the same time. Of course, I had to make a few little changes to their recipe like adding chunks of sausage, more garlic and I used thick cut bacon in the base flavor to give it some depth. You don’t have to add sausage, it’s good without it. I used a great chicken sausage made at our local Whole Foods. I’m happy with the result and hope you are too! A hearty rustic stew made with Cannellini beans, kale, sausage and bacon that is slow cooked in a Dutch oven. Dissolve 3 tablespoons of salt in 4 quarts cold water in a large bowl. Add dried beans and soak at room temperature overnight (8 hours or up to 24 hours.) Drain and rinse well. Preheat oven to 250 degrees and adjust rack to lower-middle position. Heat olive oil and sausage in a Dutch oven over medium heat. Cook until browned. Remove from pan and set aside. Add bacon (or pancetta) to the same pan or Dutch oven and cook over medium heat. Cook until lightly browned. Stir in broth, water, bay leaves, sausage and soaked beans. Increase heat to high and bring to just a simmer. Don't allow liquid to boil. Remove pot from oven, place rosemary sprigs in stew. Cover and let stand for 15 minutes. Remove bay leaves and rosemary and season with salt and pepper to taste. Serve over bread and drizzle with olive oil. Cook's Illustrated also suggests using the back of a spoon to smash some of the beans for a thicker, creamier texture. This was a fairly solid white bean stew recipe. I used 1/3 of the amt of bacon called for, and it was slightly greasy. I would stick with the panchetta if you can find it, as I think it puts off less grease. Hmmmmm, are tomatoes traditional in this dish? Not to say it does not sound good, but I think it might be better without the red. Do you think this recipe would work ok in a crock pot? line 7 says stir in the brown. you meant broth right? This sounds perfect with the fall weather here.